Break the matzo into pieces and place in a blender. Cover and blend on high to make crumbs or start with 1¼ cup matzo meal. In a 13 x 9 baking pan, generously coat with cooking spray. Add the Smart Balance and place in the oven to melt. This will take about a minute. Remove from oven. Sprinkle the matzo crumbs evenly over the top of the Smart Balance. Do not mix. Sprinkle the chocolate chips evenly over the top. Next, sprinkle the cranberries and then the walnuts. Finally sprinkle the coconut evenly over the top. Drizzle the sweetened condensed milk evenly over the chips. To make the milk easier to drizzle, place the can in a bowl of hot water for a few minutes. Cut into 24 squares while still somewhat hot. If you let them cool they become very difficult to cut. These bars are rich, sweet, gooey and definitely addictive. This recipe is a takeoff of our Outrageous Magical Bars. We love them so much we’ve converted our recipe for Passover. We’re using matzo crumbs instead of graham cracker crumbs and a spread like Smart Balance to replace the reduced-fat butter. We also added dried cranberries. They require no mixing or fussing either. Just seven ingredients layered right in the pan. 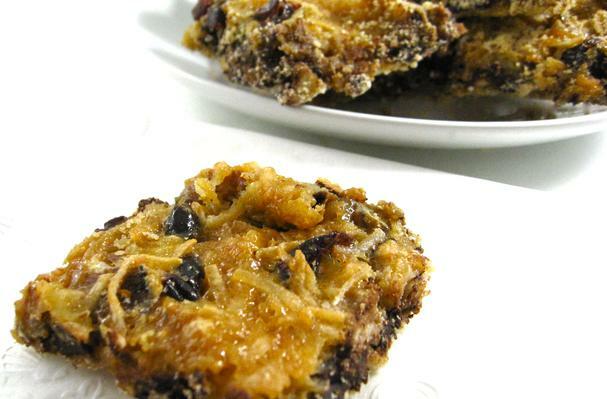 The skinny on these yummy bars is 162 calories, 6 grams of fat and 4 Weight Watchers POINTS. One regular bar has 356 calories and 23 grams of fat. Start a tradition this year because they’ll probably become the most requested dessert to make for Passover.